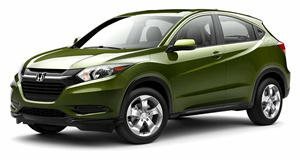 The Honda HR-V is available with a 141 hp 1.8-liter engine, mated to either a 6-speed manual or CVT transmission it produces 127 lb ft of torque. Fuel economy is good for a subcompact crossover but the HR-V’s acceleration is less than stellar. Ride and handling is commendable and all-wheel drive is optional on all trim levels while interior space and practicality is class-leading. Standard specifications are not particularly generous but do include Bluetooth compatibility and 17-inch alloys. Higher trim levels offer better value with navigation system, climate control, leather upholstery and additional safety features becoming available. The Honda HR-V is a relatively new entrant in the subcompact crossover category, it offers a smooth and comfortable driving experience with a generous standard specification level and class-leading interior space. 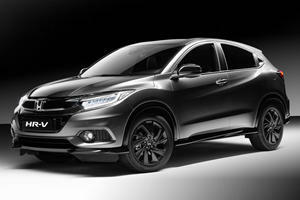 The HR-V is available in three trim levels and remains unchanged for the new model year. A pleasant surprise for this category is a cabin that offers comfortable seating for both front and second row passengers. The raised ride-height allows for a more commanding view than you would get in a similar sized hatchback and makes loading items into the cargo area less of a back breaking affair. An added benefit and unique in its class is the HR-V’s second row magic seat, this system allows you to fold up or remove the second row seat cushion which adds to the already generous cargo area. Fit and finish is also good although the prevalence of some hard plastics in the cabin do spoil things a bit. The touchscreen system, whether the base 5-inch in LX trim or upgraded 7-inch is not very user-friendly and lacks Apple CarPlay/ Android Auto functionality which may disappoint some shoppers. The HR-V drives with the kind of verve you would expect from a Honda product. Controls are light, the response from steering inputs is precise and the HR-V feels planted and stable when tackling corners with enthusiasm. The standard 17-inch wheels make for a compliant ride and while it won’t match some of its larger siblings in bump absorption it is right up there with the best in the subcompact crossover class.The available CVT transmission can cause the engine to surge in revs as it attempts to find the most efficient setting. 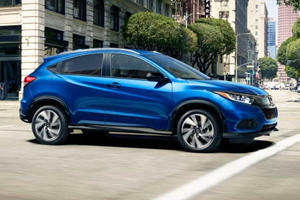 The Honda HR-V is available with a 1.8-liter inline-4 which makes 141 horsepower and 127 lb ft of torque. These are low numbers and so are the performance figures which fall short of most rivals. Despite the chassis being up for it, pushing the engine to its limits is not an enjoyable experience as the noisy buzz from under the bonnet does not materialize into appreciably faster forward progress. The two lower trim levels come standard with a 6-speed manual transmission although if you opt for the top EX-L Navi trim level a lazy CVT automatic is your only choice. All-wheel drive is optional an all trim levels but only in conjunction with the CVT transmission. As both of these have a negative impact on performance, all-wheel drive should only be chosen if really necessary. 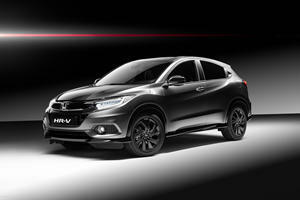 The Honda HR-V is available in three trim levels; front-wheel drive is standard on all and all-wheel drive is optional. The base LX offers a rearview camera, 4-speaker audio system with Bluetooth, 5-inch color screen with USB port as well as 17-inch alloy wheels, tire pressure monitor, daytime running lights and cruise control. The second row magic seats are also standard. EX trim adds heated front seats and mirrors, automatic climate control, keyless entry and ignition and Honda Lane Watch which includes a camera for the passenger side blind-spot. An upgraded 6-speaker audio system with HondaLink smartphone integration, additional USB port and a 7-inch touchscreen. The top EX-L Navi adds upgraded HD satellite radio, navigation system and voice recognition. Leather upholstery, leather covered steering wheel, automatic-dimming rearview mirror and roof rails are standard too. This trim can only be had with the CVT automatic transmission. The Honda HR-V is a capable vehicle offering excellent interior space along with a great ride quality and confidence inspiring handling. Performance is not particularly good although the innovative rear seat system, standard Bluetooth and available all-wheel drive mark it out as a strong competitor in the subcompact crossover market. This is an opportunity to rule the sub-compact SUV segment. Honda's subcompact crossover now comes only with a CVT.